Overwatch turned into a MOBA ??? Chaotic Videos Hello, my name is Chaotic Videos, I am a recent streamer from Twitch turned professional youtuber (Or at least getting there). I make many type's of videos on Youtube such as Gameplay, Reviews, First Looks, & many more. I do this for the fun of it and I want to help others as much as possible I am currently partnered with TGN (The Gaming Network) and I plan to make the most of my videos by helping anyone who needs it. I hope you enjoy my videos. So I have a YouTube channel and i would really love to record battlefield 4 for it. But i dont have anyone to play on PC with. Would anyone like to join me? I make very not serious content so if you are trying to be tactical, probably not the best place to look as of now... Thank You so Much! So i made a montage and i would like for you guys to upload to your channel if you'd like to. i won't post the link of the cideo here until i get a permission so it wouldn't seem like me advertising my own channel. http://www.youtube.com/watch?v=Iu1I_Supvc8 Take a look! You saw it first. Okay, after watching this is what I said to myself: 1) This should NOT be called Battlefield. When you picture Batttlefield you picture 32v32 warfare with tanks, choppers and all the liking. 2) Grappling ANYWHERE? Come on! +1 3) I love Cops and Robbers. This game seems like a tie between CS:GO and Rainbow Six Vegas. +1 What are your thoughts? http://youtu.be/jOzPVyboj1M Watch Full Screen in Original Quality :) I put in alot of time in making this so please enjoy! Tell me what you think! http://youtu.be/E3mvy5VUxwk Comment bellow what you think! Hey guys! I started to make commentary's. Hey guys, a new youtuber here!!! 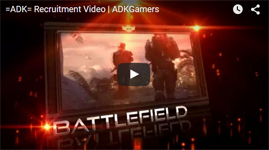 Hey guys, I just made an account here at ADK, because this looks like an awesome community to share content and create friends. I'm currently trying to make a name for myself on youtube playing and editing various games and just subbing would really help me out :) If you have any good clips or want some promotion on youtube ( i almost have 800 subs!) just PM me :) Thanks.